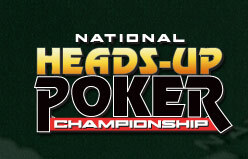 Ted Forrest has won the National Heads-Up Championship. Forrest bested Chris "Jesus" Ferguson for the title. For the win, Forrest banks $500,000. This marks the second year Ferguson finished second. Chris cashes $250,000 as the runner-up. To reach the finals, Forrest beat Sean Sheikhan in the semis. Ferguson defeated Huck Seed in his semifinal match. The win pushes Forrest's career tournament earnings to over $3 million.